Forty-five years ago I came across a sci-fi novel in the bookstore of Concordia, River Forest called A Canticle for Leibowitz. 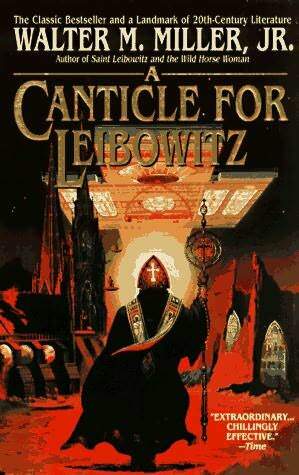 It sounded intriguing: a post-nuclear apocalypse Catholic church considering the canonization of a man named- Leibowitz?- following the discovery of some distinctly secular documents associated with him. A comedy? A send-up of Catholicism, or even Christianity? I figured the latter was unlikely, even in the pre-Paul Zimmerman Concordia's bookstore. But somehow, I never got around to reading the book. Instead, I heard over and over from time to time that it was a classic, and well worth the reading. Well, I got around to it this week. And it was both. Though it has its humorous side, the book is anything but a send-up. It's an allegory of the role of the monasteries in helping preserve the spark of science and literature during the Dark Ages. And it's a gentle rebuttal of one of the more tired and ill-informed cliches of modern, historically and theologically ignorant Atheism: the notion that the Christianity is the opponent of free inquiry and intellectual and scientific innovation. I especially enjoyed the tongue-in-cheek incident in which the theory of evolution was suggested by a monk to a skeptical representative of resurgent- but still primitive- post-apocalyptic science. After all, it was put forward by St. Augustine of Hippo a millennium and a half before Darwin. What struck me the most, though, was the third of the three stories about the Albertan Order of St. Leibowitz (who turns out, as the story has it, an actual scientist, convert to Catholicism, and martyr to the fury of the Luddite masses eager to strike out against science following the "flame deluge" of World War III). It was set a few thousand years after the beginning of the novel, at a time when the world has clawed its way out of the ashes, rediscovered modern technology, and rebuilt an even mightier and more advanced civilization than ours, colonizing the moon and Mars and experimenting on a star drive which somehow defeats relativity and makes travel over the unimaginable distances between the stars actually feasible. And is on the precipice of destroying it all with a second nuclear holocaust. It's an age so much like our own it's eerie. 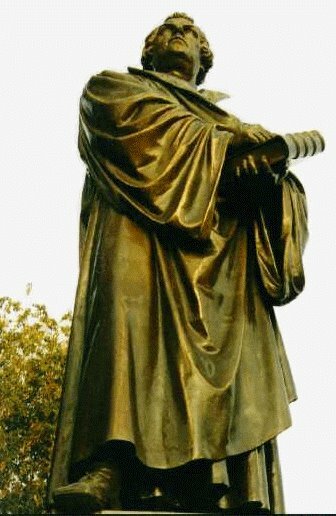 The struggle between Abbot Zerchi and a clearly decent, well-intentioned and honorable government doctor over euthanasia reads eerily like a prophesy of today's America, in which masses of similarly decent and well-meaning people have similarly forgotten God, and been seduced by a utilitarian pragmatism which in effect deifies the social consensus into espousing the indecent and the downright evil. We're having the same debate today, over the same issues, and using the same arguments, not only about euthanasia but about abortion, gay "marriage," and a host of other matters which go to the heart of what it is to be human, but are dismissed by society as matters fit for decision only by the Almighty Individual. A character in The Brothers Karamazov concludes, as Sarte paraphrases him (the quotation was never actually written by Dostoyevsky), that "if there is no God, anything is permitted." Whether Dostoyevsky actually wrote those words or not, it's the bottom line: If God isn't God, than either the government, or society, or we are individually are god. And none of these are wise enough to fill those particular Shoes. Even a free-thinker like Jefferson saw that if "nature and nature's God" isn't the source of human rights, the government- or in any case, those with power- inevitably must be. And the struggle between the abbot and the doctor is essentially the struggle between those wise enough and knowledgable enough about history and human nature to realize this, and those who- for all their good intentions- are simply not. Canticle is generally regarded as a literary classic. Sneered at by the self-impressed poseurs one would expect to snear at such a book, it's still regarded as probably the best candidate of the whole sci-fi genre for enshrinement among the great works of Western literature. Tragically, its author, Walter M. Miller, Jr, lost a long struggle with depression, taking his own life in 1996. Miller struggled with guilt feelings over his role in the mission which bombed the oldest monestary in the world, the Benedictine Abbey at Monte Cassino, in World War II. Fellow sci-fi author Joe Haldeman said that he "suffered from post-traumatic stress disorder before it had a name." It's a sad reminder of the very thing A Canticle for Leibowitz reminds us of: the perversity of human nature, and its desperate need for the light of God's face if it is to avoid self-destruction. Luther would question whether that fact necessarily means that Miller- or church musician Jan Bender, who was driven to suicide by Nazi persecution during World War II- are necessarily denied that light in eternity because they were momentarily overwhelmed by the darkness in this life. But Luther's God, and Miller's, and Bender's, is more powerful than the darkness. His Son, the Light of the World, has conquered it, and in its midst His will is always "Fiat lux!"